Snoring is a common problem for many people. There are many different things that can cause a person to snore, but one thing's for sure, snoring disrupts a good night’s sleep. Whether you are the snorer or your partner is keeping you up at night with their snoring, an easy way to get help for this problem is to look into a new pillow. Finding the best anti snoring pillow can alleviate the problem and let everyone sleep through the night. Snoring happens when some part of your airway, either in your throat or nasal passages, is blocked. There are a lot of different situations that can cause your airways to be obstructed. Some of these are harmless like the way your mouth is shaped, having a cold or sinus infection, allergies, or even alcohol consumption. But there are a few instances when snoring could be the symptom of a larger more dangerous health issue. Being overweight can lead to snoring and can be associated with sleep apnea. Sleep apnea is a serious sleep disorder where breathing starts and stops frequently throughout the night. Sleep apnea is often accompanied by loud snoring and can lead to being exhausted after a full night’s sleep and more seriously heart complications. Snoring can also be caused by the way your nasal passages are formed. A deviated septum is when the thin wall between your nasal passages is displaced to one side. This narrows the airways and makes it difficult to breathe and can lead to snoring. Sometimes surgery is needed to help reform the airways and make it easier to take in air. How Can A Pillow Help My Snoring? There is no shortage of products on the market that are aimed at alleviating snoring. You can buy breathing strips, chin straps, mouth inserts, nasal plugs, snoring alarms, and even supplements all trying to fix snoring. Many of these options are expensive or need to be replenished every so often. These costs can add up, and many people just do not have the funds to keep up with everything. An anti-snoring pillow can be a cost effective solution to easing your snoring problems. A pillow is a one-time cost that can range from $30 to $100 depending on the type that you get. Even though higher end pillows can cost a lot, these products will last for years and will not need to be replaced as often. There is a variety of pillows out there that can address a variety of snoring issues. It is fairly easy to find a pillow that will suit your needs as well as your budget and allow you to ease your snoring problems. What Kind Of Pillow Is Best For Snoring? The type of anti-snoring pillow that you choose depends on what your needs are and what kind of sleeping position you normally use. There are two general types of pillow designs when it comes to snoring. The first is the basic wedge pillow. This pillow raises your head, neck, and shoulders to help relieve snoring. Lying flat on your back often causes your airways to be blocked, and the wedge pillow addresses these concerns. The other type of pillow is more of an ergonomic type of design. These pillows can come in a U-shape, in a wave contour, or other designs. This type of pillow offers a more customized fit to help cradle your head and neck to minimize snoring. These pillows can also be a little more expensive because they are usually fit to your body shape. The material that your pillow is made of is largely personal preference, but each does offer its benefits and drawbacks. There are a lot of options so it should be easy to find one that fits your needs. One of the most popular materials for pillows right now is memory foam. This is a special kind of foam that conforms to the shape and contours of your body. This allows any pillow made with memory foam to be customized to your body. Memory foam tends to be a little more expensive for this reason, but it does offer comfort and quality for that price. Other pillows can be made from regular furniture grade foam, and these are often firmer and provide maximum support. Some people find this foam a little too stiff though and prefer to use a softer material. Synthetic fibers, like polyester, are sometimes used as well. These can be cheaper than other materials but may not provide the best support or comfort and may not be the best for snoring. Should I Buy In-Store Or Online? Where you buy, your pillow is entirely up to you. It is important to make sure that you are getting the product that will best alleviate your snoring, so keep that in mind when you choose where to shop. Buying an anti-snoring pillow online allows you to look at a lot of different pillows at once. You can browse through hundreds of pillows to find the type, and price that will work best for you. Many sites and products also offer customer reviews so you can read the pros and cons of each pillow before you buy. The one downside is that you can’t try the product before you buy it and might have to return it. It’s usually easy to send a pillow back, but make sure you check the return policy before you purchase one. If you choose to buy your pillow in a store, you have the advantage of trying it out before you buy it. While you might not have as big a selection as online, you will have the expertise of the store associates to help you make your choice. A store might also be the best option if you need to get a specific pillow under doctor's orders. Here are some of the best pillows out there for reducing or eliminating your snoring. Use these reviews to help you start your search for the best pillow for you. This wedge pillow is made to help eliminate snoring through gravity by elevating your upper body. It is made of sturdy foam with a thin gel memory foam layer on top to add comfort as well as help customize to your body. This pillow can also help with acid reflux, poor circulation, and numerous back pains and aches. It can be placed under your knees and lower legs as a way to ease pressure on your lower back. It comes with a soft knit cover that can be removed for washing and is available in three different heights so you can choose the best one for your needs. Some people might find that the gel memory foam layer is a little thin and need to use extra pillows for added comfort, but the firm base is great for those that like maximum support. This pillow is a little pricey, but it offers high-quality materials. Make sure that you pick the height that will allow you to sleep comfortably while easing your snoring problems. This is another wedge pillow that works to ease your snoring by elevating your upper body. It is made of a very dense core foam and then surrounded by a memory foam layer. 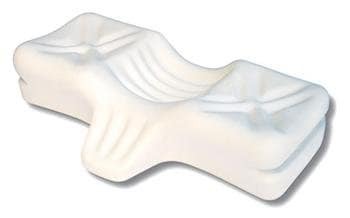 The design of this wedge helps position your body into the correct posture for no snoring. It also comes with a velour cover that is removable for easy cleaning. This pillow is much larger than most wedge pillows so it can accommodate both side and back sleepers. Because of its size some people might find that the angle is a bit extreme for their comfort, but if you need a lot of elevation, this might be the best pillow. This is an expensive pillow, but it comes with a lifetime guarantee. If the pillow stops working or breaks down, you can send it back. Also, even though it has a soft memory foam layer, the dense core foam might be a little too hard for some people. This pillow might look like it won’t be comfortable to sleep on, but the opposite is true. The Womfy pillow is made to fit the shape and contours of your head so that it shifts the weight of your head away from your face and ear. It helps to align your spine and stops the compression of your mouth that might cause snoring. It is made from memory foam and comes with two different levels of firmness so you can pick what type of support you want. It has a slipcover that is made from 95% bamboo and 5% spandex and is also hypoallergenic. The pillow comes with a riser as well in case you want to elevate your head while you sleep. One of the problems that some sleepers might have with this pillow is its size. It is a little smaller and might not fit the distance between the neck and head. The shape of the pillow might also take some getting used to since it is different than standard pillows. Other than that, this pillow offers a better night's sleep by helping to alleviate snoring as well as ear, neck, back, and sinus pain. One factor in snoring is your sleeping position. Laying flat on your back often makes snoring worse, and this U-shaped pillow is perfect for helping you sleep on your side to ease snoring. It is made of cotton and polyester blend, and the shape helps put your head and neck in alignment to ease the pain that might come with sleeping on your side. It also has a special ear notch so that your ear can fit comfortably on the pillow without feeling extra pressure. It comes with a removable pillow cover to ease washing. This pillow might be a little hard to adjust to in the beginning, especially if you are not a side sleeper. While it does properly support your head and neck, the cotton blend is a softer material, and if you need a firmer pillow, this might not work. It does have a good price point and helps correct poor sleeping posture and eliminate snoring. This pillow is for both back and side sleepers and is made to specifically support the head and neck in each position. The way that this pillow is designed prevents your head from being pushed forward which can lead to blocked airways and snoring. It has three different components all made to provide the best comfort. The wedge extension supports your upper back, the cervical contour maintains the natural curve of your neck, and the center cavity cradles your head for support. It is made of non-allergenic foam and comes with a zippered pillow case that can be removed for washing. This pillow can take some getting used to simply because the design is not the same as other pillows. Therapeutica offers five different sizes of this pillow and tells you how to measure your head and neck so that you choose the right one. They have a five-year warranty that guarantees the shape and resilience of the pillow, but all sales of the pillow are final. If you need to send it back, your replacement has to be the same cost and size as the original.